"Build a better mousetrap and the world will beat a path to your door" -- a famous quote from none other than Ralph Waldo Emerson, and one that most golf club designers must have hanging over their workbenches. Building the next best golf club, whatever the type, is standard procedure these days. No exception to that quest is Terry Koehler, president of Eidolon Golf. Mr. Koehler has had quite a career in golf club design, and his most recent venture into wedge design -- with Eidolon Golf, LLC -- has yielded some interesting results. Eidolon wedges are designed with a "V-sole" (patented) -- two converging angles that allow the golfer to create a variety of loft/lie/bounce combinations and get the benefit of 2-3 wedge performance characteristics out of each Eidolon wedge. The Eidolon wedges utilize Hi-Spin CNC milling technology to create the ultra-sharp grooves in their wedges as well (the standard groove in an Eidolon wedge meets USGA limits for amateur and low-tier professional play -- if you're a PGA Tour player looking for a new wedge, then the Eidolon Prime wedges are for you). These grooves create extremely high spin rates, and of course stopping power on the greens is the natural extension of that. Eidolon wedges are available in: Pitching, Gap and two versions of a Sand wedge. Both Right and Left hand orientation (though with some limitations in LH models). The heads are made from soft 8620 Carbon Steel, the same material preferred by most pro golfers for its soft feel and dynamic feedback. Head finishes are either satin chrome or oil/raw (no glare finish). Shafts are a proprietary steel called "Genius," with two graphite Genius options available for an upgraded cost. Clubs are available as individual wedges or sets of three. 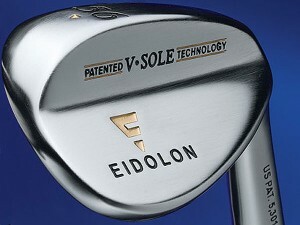 Strikingly handsome no matter the finish chosen, Eidolon wedges seem well designed for their intended purpose.